His tremendous effort in the martial arts industry has created the future for the later martial arts actors such as Jackie Chan and Jet Li. Both of these actors have brought the martial arts to the international arena. In fact, Jackie Chan was a stunt double for the villain Mr. Suzuki in Fist of Fury and in the film Enter the Dragon, Jackie was one of the henchmen disposed of in the underground lair. Bruce was married to Linda and had 2 children, Brandon Lee (born 1965) and Shannon Lee (born 1969). Brandon, an actor like his father, died on a movie set while filming The Crow on March 31, 1993. 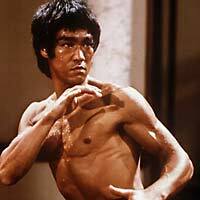 Bruce died while filming Game of Death. fluidly adapted the most effective elements of as many fighting techniques as possible — an inspiration to modern mixed martial arts. He was the father in the martial arts industry. This entry was posted on Tuesday, November 28th, 2006 at 4:45 pm	and is filed under Interesting Stuff. You can leave a response, or trackback from your own site. One Response to "The Kungfu legend"